The conflict is between the provinces of Mendoza and La Pampa on the Atuel river, going back more than 60 years. Mendoza "steals" the water. The conflict is between the provinces of Mendoza and La Pampa. Discussion dates back to the early twentieth century, when Mendoza began to divert several arms of the Atuel River to operate new irrigation canals. The province of Mendoza was already a federal state, but La Pampa had less power, it was still dependent on the central power because until 1952 it had federal territory status. In 1918 the first diversion of the main branch of the river, Atuel Viejo was performed. The work took place in Paso El Loro, and caused the virtual disappearance of the tributary. The site Chalileo Island was directly damaged, it stopped being one of the most fertile regions of La Pampa. Already damaged by erosion and drought, with severe consequences for the quality and richness of the soil, the province of La Pampa began to point out the problem of lack of water as the cause of the deterioration of the local fauna and flora. Worse, the falling agricultural production and low productivity of the land also caused the migration of residents and stagnant economic activity. In 1948 the state-owned Water and Power ordered an annual delivery of water for consumption of the Pampas, for irrigation and livestock production. The decision was temporary. Studies were promised to make definitive decisions on river flows for La Pampa. 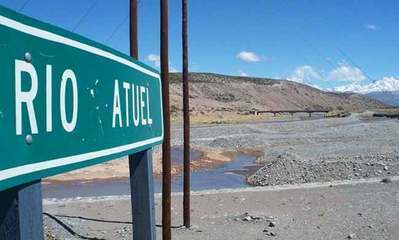 In 1978, in the framework of negotiations on other river diversions (as in the Colorado River Basin), which involved several nations or provinces, the case of Atuel was also discussed. It was agreed that Mendoza would perform works to redirect the flow of the Rio Grande to the Atuel . The project would increase the very scarce volume of water that reaches the Pampa. But the project, the Portezuelo dam, is still pending. Moreover, there are objections to the initiative, because the salinity could affect the lands of the basin. In 1947 the construction of the first dam system Nihuiles cut river flow for several decades. In 1987, the Supreme Court established the interprovinciality the river, although this did not achieve a constant minimum flow to La Pampa. Today, Mendoza uses water as a source of electrical energy, for domestic consumption and irrigation, particularly of vineyards, while lots of communities of La Pampa are affected by the lack of water and are in the process desertification. In 2008, a framework agreement signed by the governors of Mendoza and La Pampa, and the national government, established the division of the total registered water evenly between the two jurisdictions. The agreement, however, had to be ratified by the provincial legislatures. In 2015 the conflict continues, with complaints from La Pampa, sometimes blockading roads. 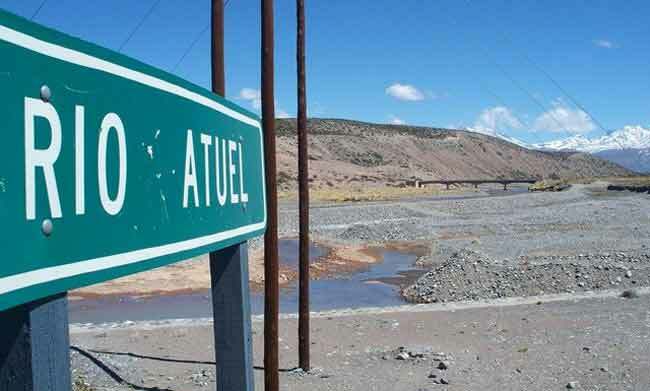 Project Details The project would consist in ensuring the wate flow in the Atuel river before it reaches La Pampa province. BUENOS AÍRES, 8 DE DICIEMBRE DE 1987. Why? Explain briefly. The province of Mendoza keeps the water from the river Atuel, and the province of La Pampa feels agrieved and demands water since 60 yars ago and still without success in 2015. The wine industry (with irrigated vineyards) in Mendoza is quite powerful. Concesiones para el aprovechamiento de aguas públicas. Aprobación del acta acuerdo entre gobierno nacional y provincial sobre financiamiento de la obra presa central Portezuelo del Viento. Ratificación de convenio entre la Nación y Mendoza-La Pampa. Declara reserva de recursos y reserva hídrica natural. Lecciones y Ensayos, Pág 227, Año 2006.